This is a great recipe for your vegetarian guests and easy to prepare. 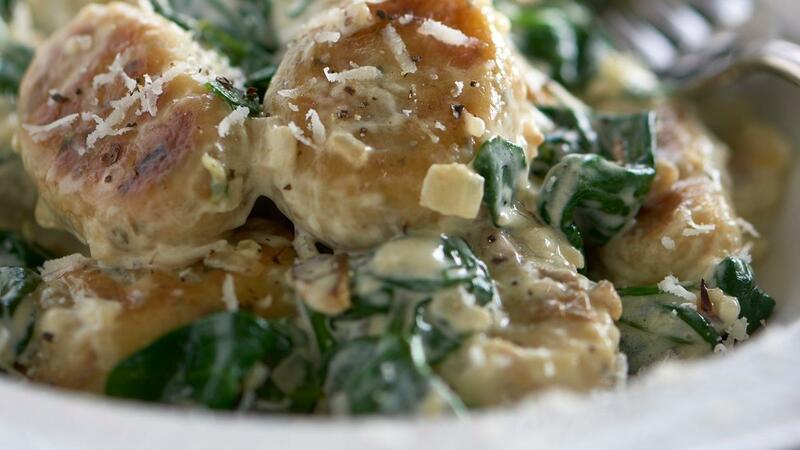 Serve the Italian potato dumplings with some fresh spinach, mushrooms and a tasty parmesan Sauce. Preheat an oven to 180°C. Line a baking tray with foil. Pierce the potatoes with a fork and bake for 1 hour or until tender. Peel the potatoes and press the potato flesh through a potato ricer into a large bowl. Weight 1kg of the mashed potato add the salt and beat in the flour and egg yolk until the mixture comes together as a soft dough. Turn the dough out onto a lightly floured work surface and divide it into quarters. With each quarter shape it into a 20-inch-long rope. Cut each rope into 20x 1-inch pieces. Roll each piece into a ball. Working with 1 ball at a time (cover remaining dough to prevent drying), using your thumb, roll dough piece down the teeth of a lightly floured fork (gnocchi will have ridges on 1 side and an indentation on the other). In a large sauce pan bring the water to a gentle simmer, add half the gnocchi to the boiling water. Cook for about 3-4 min. or until the gnocchi rises to the top. Remove the gnocchi and place in a colander to drain. Repeat the cooking process for the other half of the gnocchi. Add the MEADOWLAND Professional to a large saute/frying pan and heat until melted. Add the cooked gnocchi and fry till golden, set a side and keep warm. Heat the MEADOWLAND Professional 250g in a sauté pan on a medium heat. Add the mushrooms and sauté for approximately 8-10 min. until the mushrooms are golden. Then add the KNORR Professional Garlic Puree and salt, cook for 5 min. Then add the MEADOWLAND Single and water and cook for a further 10 min. until the sauce is creamy in consistency. Add the spinach and parmesan. Spoon the gnocchi onto plates, top with the mushroom and spinach sauce and finish with additional parmesan if required.